In Ancient Greece, people would associate every element of the world with a deity; and so the sun might be considered to be Helios, the Moon might be Selene, and the winds would be the four Anemoi. The most essential of all elements though was water, and as a result water would have a whole plethora of deities associated with it. Major sources would have a powerful god linked with it, with the likes of Poseidon and Oceanus, whilst minor sources would have minor gods and goddesses. Oceanids were some of these minor deities, and would therefore be associated many sources of freshwater. The Oceanids were the 3,000 daughters of Oceanus, the Titan god of the earth encircling river, and his wife, the Titanide Tethys. 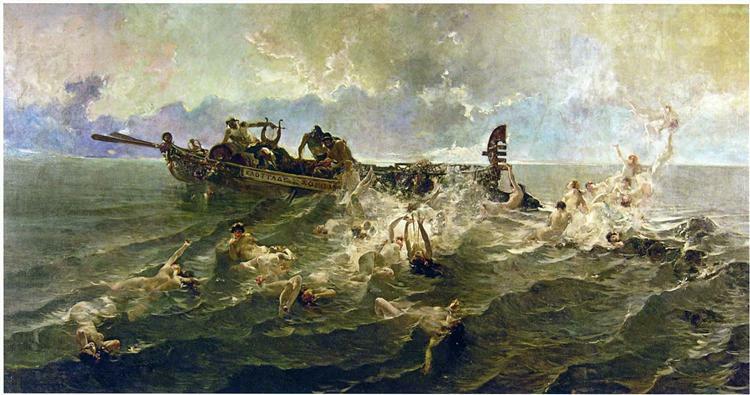 This parentage made the Oceanids sisters to the 3,000 Potamoi, the river gods of Greek mythology. 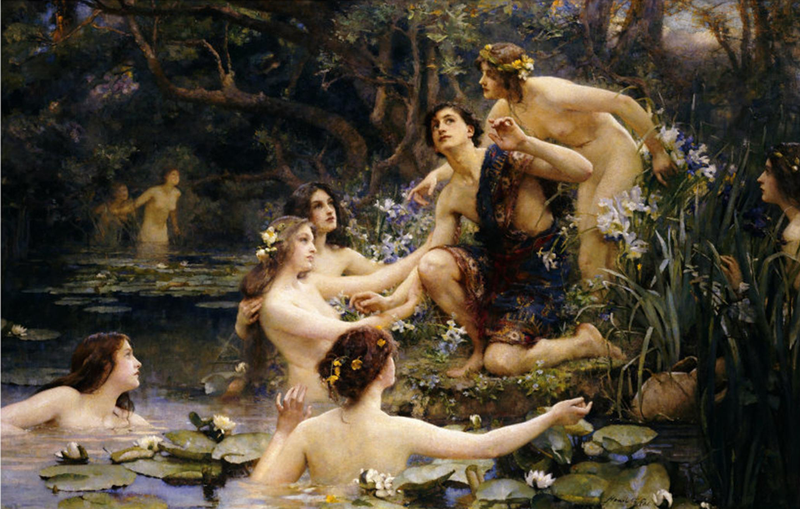 In the ancient sources the Oceanids would be split into five different groups; the Nephelai were cloud nymphs; the Naiades were the Oceanids associated with fountains springs and wells; the Leimonides were nymphs of the pasture; the Aurai were nymphs of the water found in breezes; and the Anthousai were the Oceanid nymphs of flowers. The Naiades were commonly thought of as being the wives of the Potamoi. Although writers in antiquity would talk of 3,000 Oceanids, the figure was purely nominal, and from the ancient texts, about 100 distinct Oceanids can be identified; and even of these 100 Oceanids some are far more famous than others. The 3,000 Oceanids were probably not all born at the same time, and as such some, assumed to be the eldest, are named as Titanide, female second generation Titans. These second generation Titans being Metis, Styx, Dione, Doris, Clymene, Eurynome, Elektra, Pleione and Neda. Metis – Metis was the first Goddess of Wisdom, and would counsel Zeus during the Titanomachy. After the war, Metis would become Zeus’ first wife, but when a prophecy was made about the son of Metis being more powerful than the father, Zeus swallowed his wife. Athena would eventually be born to Zeus from Metis, and Metis would continue to counsel Zeus from her internal prison. Styx – Styx was the first deity to join the forces of Zeus during the Titanomachy, and so was honoured by Zeus by being made the goddess of the River Styx which flowed through the underworld. Swearing on the Styx would be a binding oath for the gods thereafter. Dione – Dione was another important Oceanid, for she was also known as Dodona, and associated with a spring. Dione though was also the goddess of the Oracle of Dodona, one of the most important and sacred sites in Ancient Greece. Doris – The Oceanid Doris would marry the sea god Nereus, and with her husband would become parent to the 50 Nereids, the saltwater sea nymphs. Clymene ­ - Clymene would become the wife of the Titan Iapetus, as well as becoming the personification of fame. Clymene would famously become mother to four Titan sons; Atlas, Menoitius, Prometheus and Epimetheus. Eurynome – The Oceanid Eurynome would be one of Zeus’ lovers, and from their relationship the three Charities (Graces) were born. It was also Eurynome who helped nurse Hephaestus when he was thrown from Mount Olympus. Electra – Electra would marry the sea god Thaumas, and would become mother to the Harpies and to the messenger goddess Iris. Pleione – The Oceanid Pleione would become wife of the Titan Atlas, and would provide the Titan with seven beautiful daughters, the Pleiades. Pleione’s sister, Hesione, would marry Atlas’ brother, Prometheus. Neda – In one version of the infancy of Zeus, Neda, along with her sisters Theisoa and Hagno, was a nursemaid of the god. A second Oceanid Clymene (also known as Merope) was named by some writers as a lover of Helios, who would provide the sun god with a son, Phaethon. Helios would also have a relationship with another Oceanid, this time Perseis, who would give birth to four famous children; Aeetes, Circe, Pasiphae and Perses. Many of the Oceanids were nursemaids and attendant to other Olympian gods. The Five Nysiades were said to be nursemaids of Dionysus, whilst 60 virgin Oceanids were attendants to Artemis, and others attended Hera, Aphrodite and Persephone. Metis (Wisdom) and Clymene (Fame) were not the only Oceanids who were also personified blessings, for other Oceanids were also named similarly; Peitho (Persuasion), Telesto (Success), Tyche (Good Fortune), and Plouto (Wealth). Some of the Oceanids would be specifically linked to regions and settlements, rather than a single water source. The Oceanid Europe was of course linked to Europe, Asia to the Anatolian peninsular, Libya to Africa, Beroe to Beirut, and Kamarina to Kamarina in Sicily. 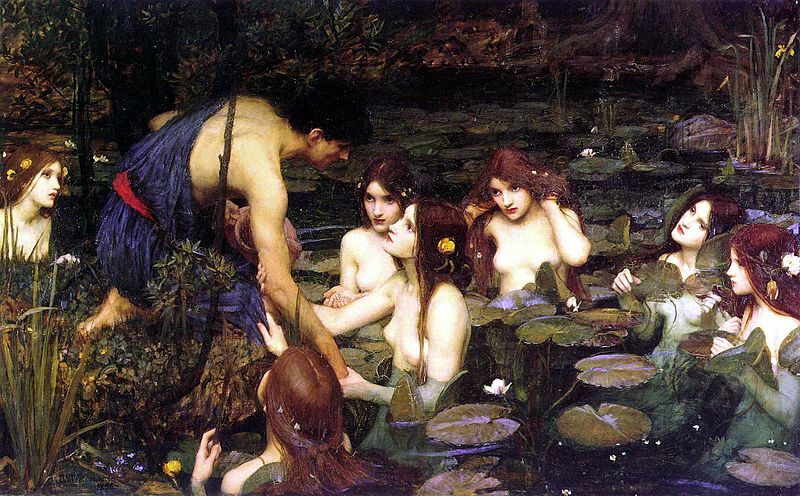 Occasionally, ancient writers would name Amphitrite, the wife of Poseidon, and Thetis, mother of Achilles, amongst the Oceanids, but these two famous water nymphs were more commonly thought of as Nereids. 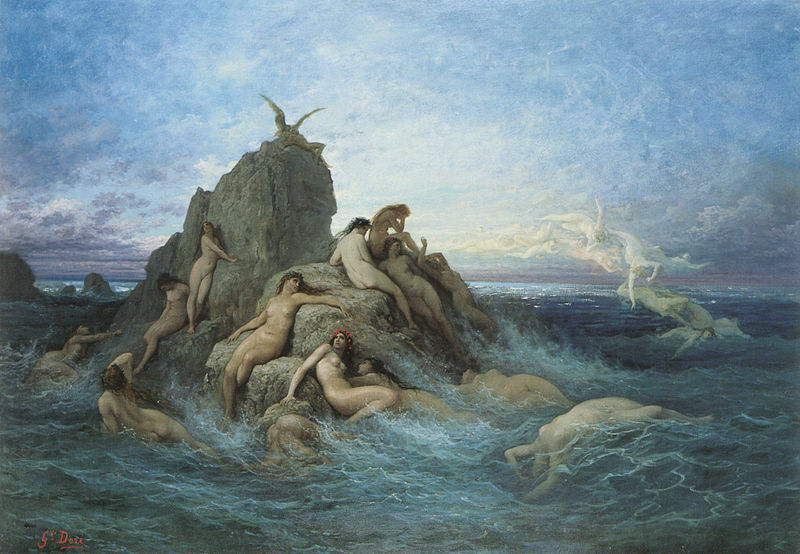 Nereids were the nymphs of saltwater, and Oceanids were the nymphs of freshwater despite their name (Oceanus being thought of as the freshwater river that was believed to encircle the earth). The Nereids were said to be 50 in number, and were the daughters of Nereus and Doris, their role was often thought of in terms of companions of Poseidon.